As with tissue repair, successful development of engineered cell or tissue analogs requires the re-creation of a biologically active extracellular matrix. The cellular mechanisms and structural requirements that control the assembly of the ECM are not well understood. As such, attempts to reconstitute this complex environment in vitro in order to create functional tissue analogs have met with limited success. Cell-imbedded collagen ring placed on nylon grips and attached to an MTS Q-test 5 machine for mechanical testing. Our work in this area focuses on developing novel ECM-based therapies to promote tissue regeneration and accelerate wound repair. These approaches include engineering small molecule analogs of extracellular matrix proteins for topical application to wounds and the use of therapeutic ultrasound to up-regulate extracellular matrix function in engineered tissue constructs. 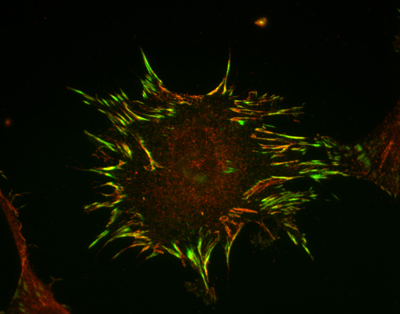 Immunofluorescence image demonstrating clustering of activated beta-1 integrins (red) into vinculin-containing focal contacts (green) in response to fibronectin. 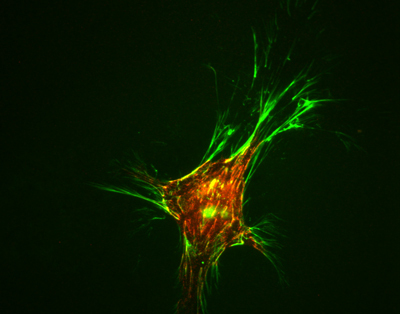 Immunofluoresence image illustrating "matrix adhesions" composed of fibronectin fibrils (green) and tensin (red). Researcher: Denise C. Hocking, Ph.D.